What could be nicer on a warm, sunny spring day than to enjoy a leisurely wander along a canal towpath. With this in mind, we jumped in the car and drove to Newbury, a market town in West Berkshire. The town is approximately 30 minutes drive from Oxford and about an hour by train from London. 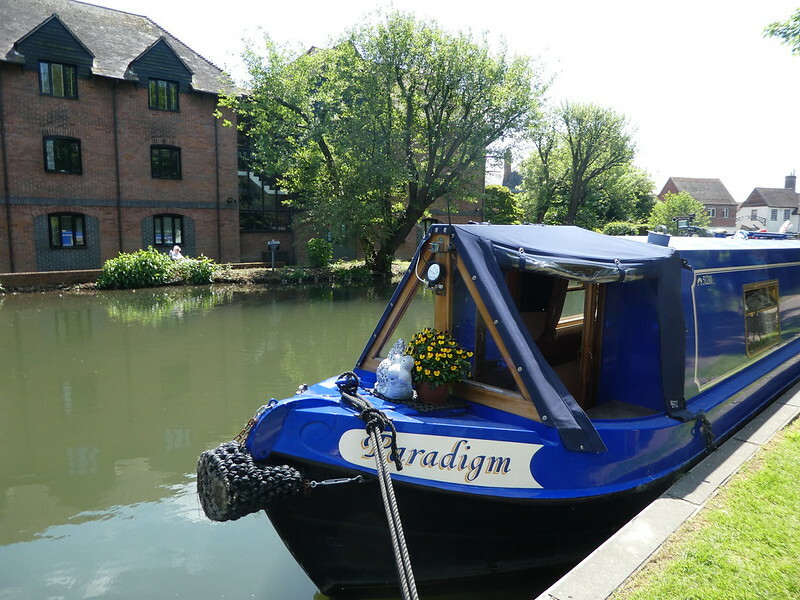 We parked on the edge of the town in the Newbury Goldwell car park beside the leisure centre which offers unlimited free parking on Sundays (£1 for four hours the rest of the week) and is an ideal starting point for a gentle stroll along the canal. Leaving the car park we took a right turn along a tarmac path crossing two footbridges to reach the towpath of the Kennet and Avon canal. From the bridge we could see several brightly coloured narrowboats moored on both banks, some of them with flower pots on their roofs. From here, we headed in an easterly direction with the canal on our left, along the towpath towards the bustling centre of Newbury. 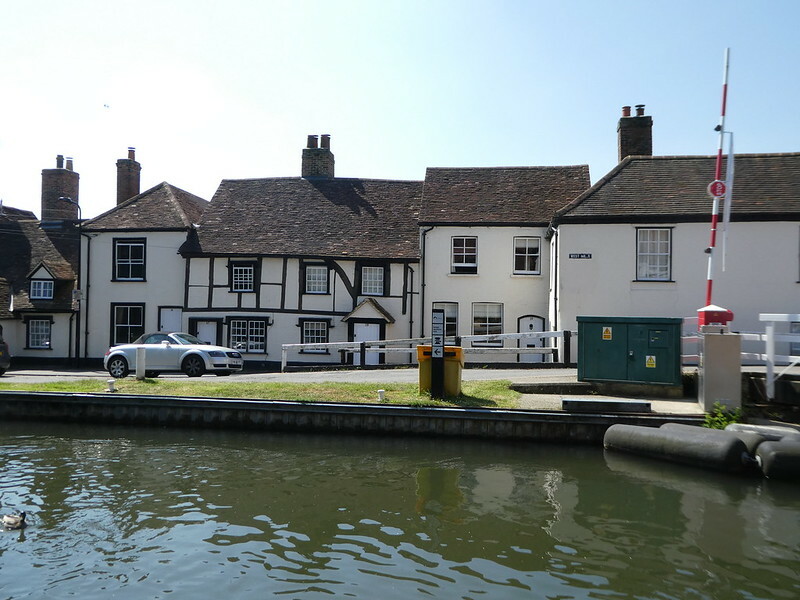 Development of the canal dates back to the early 18th century when the River Kennet was made navigable for barges between Reading and Newbury by dredging, cutting lengths of canal and building a series of locks. The canal was further extended all the way to Bath in 1795 connecting to Bristol via the River Avon. When the canal first opened it formed a key trade route connecting to the two ports of Bristol and London via the River Thames. The coming of the railway signalled the end of the canal’s prosperity as it offered quicker journeys for both goods and people. 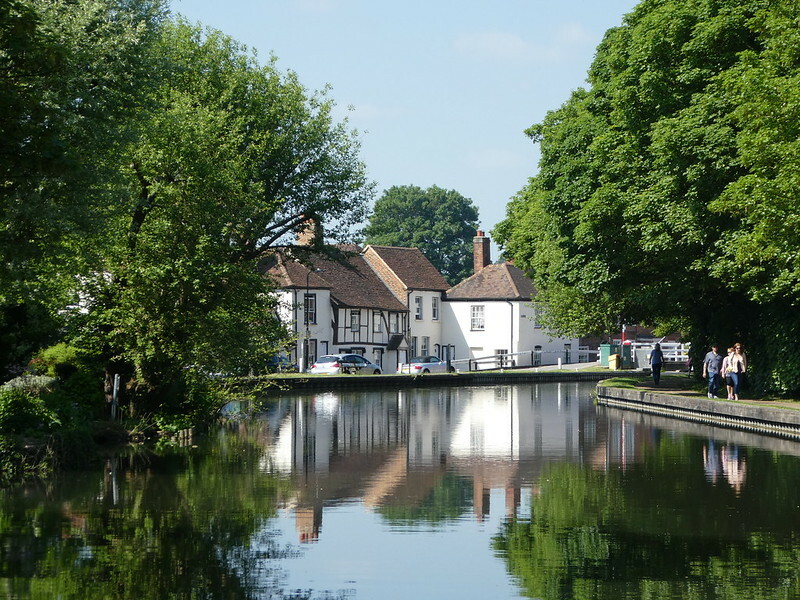 Canal trade then gradually decreased and by the early 1950’s the canal had fallen into disrepair and it was no longer possible for a boat to pass between Newbury and Reading. 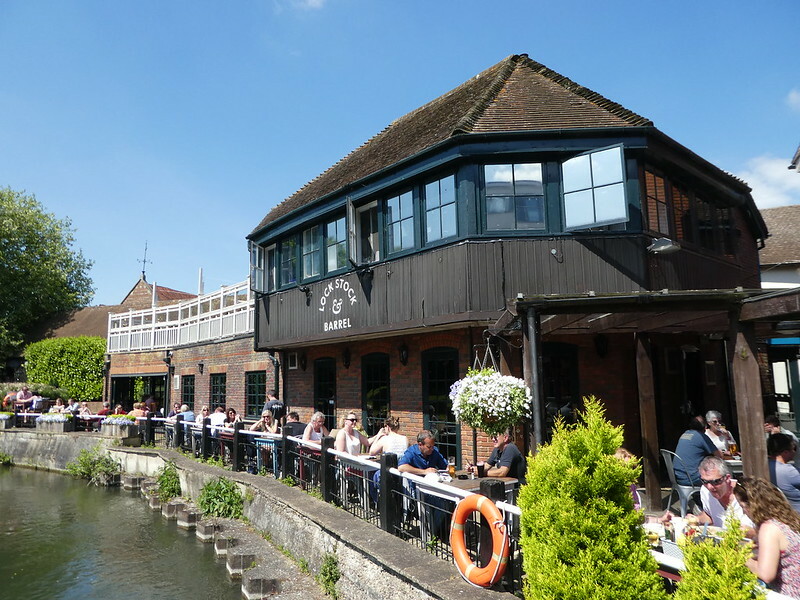 The Kennet & Avon trust was formed in the 1960’s reversing the decline and enabling the canal to re-open for pleasure traffic in the 1990’s. Walking a little further, we came to the Mills Swing Bridge where the towpath crosses to the opposite bank. As we approached, the bridge was being operated by a boater who just needed to insert a key and press a few buttons to lower the barriers. Several people had gathered on either side of the bank not only waiting to cross but also enjoying watching the boat pass through. A few minutes later the bridge was securely back in place allowing us to cross and continue along the towpath towards Newbury Lock. Overlooking this lock we spotted a very attractive pub aptly named The Lock, Stock and Barrel. It’s outdoor terrace was filled with people enjoying drinks and bar snacks in the warm sunshine. The road crossing Newbury Bridge is a wide, semi-pedestrianised shopping street (vehicles only allowed in the evenings). Along here are a mix of local independent shops and the usual high street names. By chance, we had arrived as the monthly artisan market was taking place (last Sunday of the month) with arts and crafts, street food and children’s activities. Arriving at the tree lined market square, numerous historic buildings have been retained including the medieval Cloth Hall which is now used as an arts venue and theatre. The market has a long history and is believed to have taken place since Anglo-Saxon times. Nowadays markets take place on Thursdays and Saturdays but as we were visiting on a Sunday the square was empty. A good reason to return one weekend to enjoy wandering around its stalls. After finding a cosy pub for some lunch we returned to the car along the canal towpath and noticed the Kennet & Avon Canal Trust Jubilee narrow boat passing through the lock. Pleasure trips operate at weekends and also on Thursdays during the summer months. More information can be found on its website, here. I love your pictures. It makes me want to do the walk. Thank you so much Anne, I really is a lovely walk along the canal in Newbury! We have peddled along here with Talula, it really is lovely! Thank you for making contact, it’s good to hear from you. We loved our walk along the canal towpath and hope to return. Looks like I will have to take a trek and follow in your footsteps. Enjoyed your post, very much. Thank you, its good to read you enjoying about my walk along the canal. Well said and such a rich heritage! Looks amazing! If you had to pick your top 3 UK destinations/ days out what would they be? The canal boats are charming, it must have been lovely to take the time to stroll and view them. Also some stunning canal-side buildings. Such a rich heritage! Thank you Helen for taking an interest in this canal-side post. The Kennet and Avon is beautiful. Lovely post. I can feel the warm sun on my skin when reading this and wandering along with you! Thanks for sharing! It’s my pleasure Marcus, it’s lovely that the long days of summer are with us, isn’t it! This town is adorable! You’ve captured it well. Thank you Monique, it’s so nice to read you are enjoying my posts. Absolutely lovely post, most enjoyable, thank you! Thanks Karen for your kind words and support of my blog. Just when I think your last trip was great another one pops up that is better…. Thanks Sue, you must be my number one fan! Those canal pictures are great. How nice it would be to drift along them on a holiday just relaxing and watching that wonderful scenery pass by. Thanks Ian for your welcome thoughts on the Kennet & Avon Canal. When the weather is good, a few days drifting along the canals would definitely be lovely. Lovely photography! We are planning a trip to the U.K. in September so it is fun to read about your adventures. Thank you for your kind words. I’m certain you will have a lovely time visiting the U.K. in the autumn. Looks like a very lovely place to visit. Your photos are excellent, as always. After having done a few barge trips in Europe, I have to say that those remodeled barges look like a great way to live and travel. Thanks Elene for your welcome thoughts. I have been on canal holidays in northern France but not so far in England. Scenic and historic, looks like a real life western-RPG (Witcher type)! Thanks for taking an interest in this post. Newbury looks great and I especially like the look of the Lock Stock. Canals are fascinating to walk along and explore aren’t they? Lovely photos. 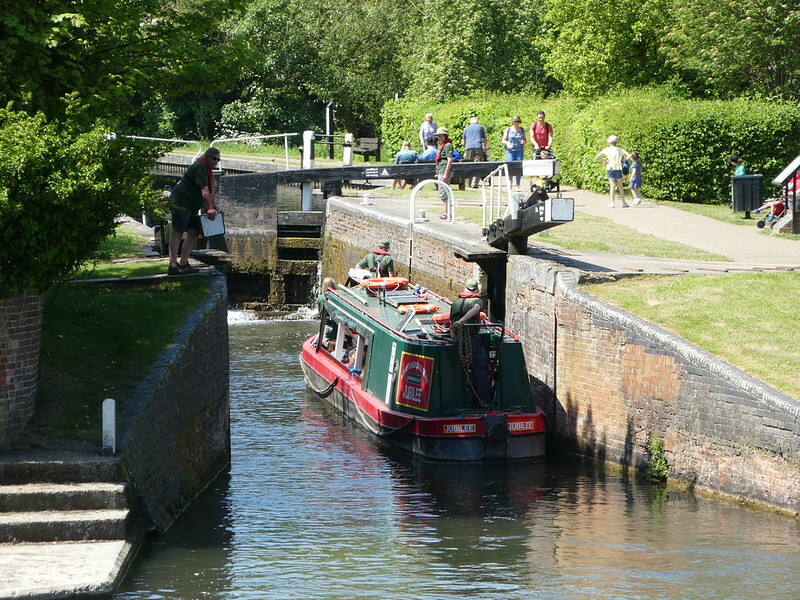 Thanks Jonno for your kind words, Locks are fascinating especially when a boat is passing through them. Delightful post and photos. A quilter I follow (Gourmet Quilter . wordpress . com ) lived on one of those boats for a year, and managed to keep a sewing machine and do quilting videos. I love that you shared a bit of the history! Thanks. It’s so nice to hear from you. How lovely that you lived on a canal boat for a year and happily continued your quilting hobby on board!! It’s my pleasure Kelly. Nice to read you enjoyed it. It looks beautiful I was reading this whilst listening to the rain outside. And this post brightens up my Monday. Thanks for your welcome thoughts and sorry to read that it’s raining with you. It’s a bit gloomy here but still fine. 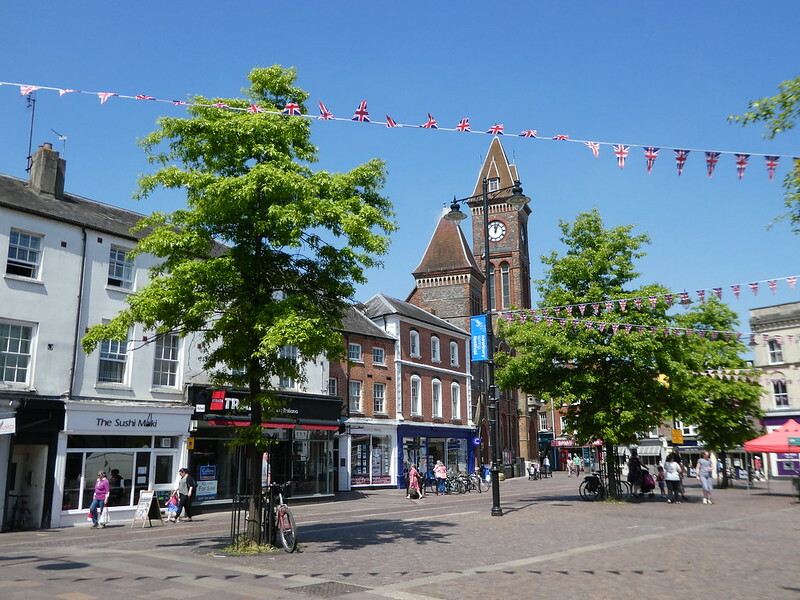 We were fortunate with our recent visit to Newbury to have some gorgeous weather. I’ve not visited South Africa yet but Cape Town is high in my list. It looks gorgeous! Hope that you do come it is beautiful in my very biased opinion ha ha ha. It’s a bit far south for me but would make an ideal Monday walk. 🙂 🙂 I’m off to Poland next weekend so my walks will be on hold for a while. Happy Monday! Enjoy your stay in Poland, I’m sure you’ll have a lovely time. 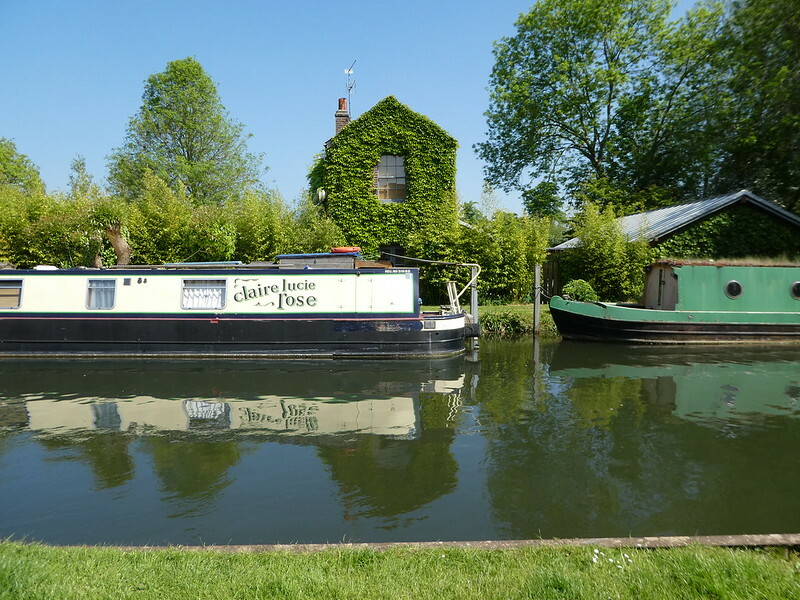 A visit to Newbury and a walk along the Kennet & Avon canal is a relaxing way to spend a few hours if ever you are in the area Jo. It’s nice that the canal has been restored. It looks like a lovely spot. 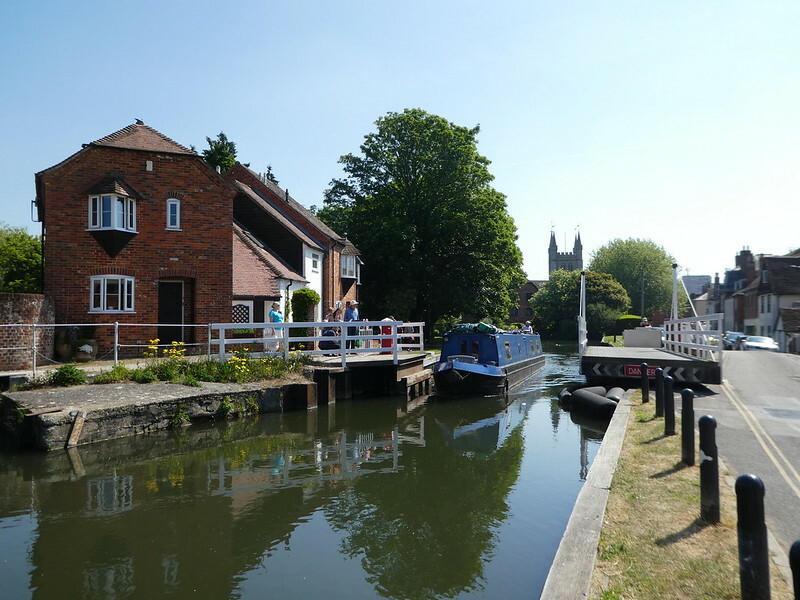 The Kennet & Avon is a beautiful stretch of canal, thank you for taking an interest in this post. Looks like a lovely place to spend a day. I went near to Newbury when I visited Highclere Castle, but never went into the town. Beautiful photos : ) I will have to visit, for sure. Thanks Sarah for your much appreciated thoughts. I haven’t been to Highclere yet but hope to add it to my list soon. Just beautiful and I think I should relocate 🙂 Thanks for sharing! Thank you for your kind words, it’s a lovely stretch of canal. Thank you for your kind words on my photos Paul.